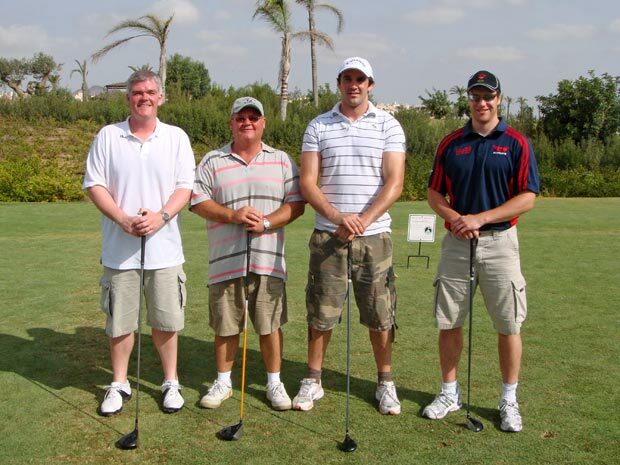 Stuart Thomas, Managing Director of Calida International Properties was joined on the golf course at Roda Golf by Wales rugby superstars and 2007 and 2008 - 6 nations grand slam champions Jonathan Thomas (Neath & Swansea Ospreys) and Mark Jones (Llanelli Scarlets). Also playing to make up this truly international foursome was Trevor Jordan from Belfast, also an owner at Roda Golf and Beach Resort. Stuart is unhappy to report that yet again Mark Jones won the competition, with a stunning 39 stableford points! The standard of golf was very good, particularly from the rugby boys, just back from a tough tour in South Africa with the Welsh national team. The two highlights of the day were Trevor Jordan holing a 45 foot putt for eagle on the 5th par 5 - great putt Trevor and a fantastic eagle! And also Jonathan Thomas made a 40 foot putt on the 17th par 4 - nice one JT! The very enjoyable round was finished off with a couple of cold beers at the fantastic Roda Golf clubhouse, paid for by Trevor! Pictured from left to right, Trevor Jordan, Stuart Thomas, Jonathan Thomas and Mark Jones.